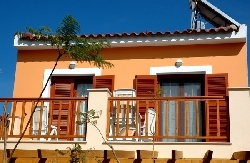 VILLAS AND APARTMENTS TO RENT IN SAMOS, GREECE. Welcome to our selection of holiday homes to rent in Samos, Greece. Samos is one of the most beautiful islands in Greece and is a great place to visit. You can start with a visit to Kokkari, the most beautiful village on the island, a hot spot for wind surfers. The beach is not very comfortable and the waves high. So if you are with family and children, Tsamadou may be a better option with its green landscape, crystal blue waters and white pebbles. Samos town itself spreads around the slopes of the bay and provides a picturesque view of the sea and the surroundings. Move on to Avlakia that lies between the sea and steep pine clad slope to catch the sunrise that is quite spectacular. There are some great beaches here too, most notably Tsabou and Velentza. The Agios Nikolaos Church at Potami is a visual treat as it stands on a cliff overlooking the beach and the bay of Potami. Take a look at the Efpalinion Tunnel built by hand in 6 B.C. and is an amazing feat of ancient engineering. It was built to supply water to the city of Samos through a mountain. It is said to have been started from both ends and meeting at the middle to an accuracy of a couple of inches. This is a place of history and you must visit the Archaeological Museum to see, admire and appreciate the many statues and artefacts that celebrate the rich heritage. There is even a 16 feet tall freestanding statue here. Move on for some water sports at the Samos Dive Centre for a great diving experience. Besides this, you can try snorkelling and fishing and other water sports. Samos also has many caves that are home to a church, a refuge for Pythagoras and fascinating formations of stalactites and stalagmites. There are many interesting festivals celebrated in Samos. If your holiday coincides with one of them, make sure you join in the celebrations to spice up your vacation. If food is your weakness, head to Vathy to try some of the local cuisine at the many traditional taverns and restaurants. While here, try the local wine that is quite famous. Top up your holiday with souvenirs, leather and jewellery, besides art or antiques. You might also want to pick up a special kind of rug, called Flokati, found only here. A visit to Samos promises to leave you with a wonderful time. Looking for self catering holiday accommodation in Samos? Then below is a selection of apartments in Samos and villas in Samos that can be rented direct from their owners. You can either click on each listing for further details or you can use our search engine on the left if you are looking for something in particular.